Like anti-smoking skin patches, iontophoresis involves the delivery of medication directly through the skin, but the use of low-level electrical current allows the medication to be delivered more quickly than with ordinary patches and with less side effects. Problems with needle phobia and the trauma associated with needle insertion are also avoided as well as the risk of injecting large amounts of steroid into an area where it could cause tissue damage. Iontophoresis involves placing two electrode pads on the patient—one medicated pad, and one dispersive pad. Electrical current assists the movement of ions across the skin utilizing basic electrical principles (like charges repel each other and opposite charges attract each other). The current applied to the medicated pad matches the polarity of the medication absorbed in it, allowing the direct electrical current to "push" the drug through the skin. The dispersive electrode, placed away from the affected site, completes the circuit. 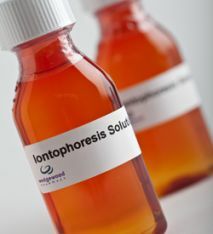 Medication administered by iontophoresis is also transferred across the skin by passive diffusion. Passive diffusion involves the movement of drug molecules from areas of high concentration (medicated pad) to areas of low concentration (tissue). Iontophoresis can be used to relieve pain from conditions such as tennis elbow, carpal tunnel and other wrist injuries, lateral ankle sprains, and patellar tendonitis. Iontophoresis is also effective in shoulders after rotator-cuff repair, to reduce inflammation and swelling. Treatments are generally short taking five to 20 minutes and are done every other day for one to two weeks to allow time for the accumulation of medication in the inflamed area and evaluation of the patient's progress. Most patients require approximately six iontophoresis treatments. However, depending on the severity and acute or chronic nature of your condition, your clinician may determine that as few as four or as many as 12 treatments may be necessary. There are many different medications and supplements that can be applied through iontophoresis, but therapists most commonly use dexamethasone sodium phosphate, an anti-inflammatory drug, with lidocaine. 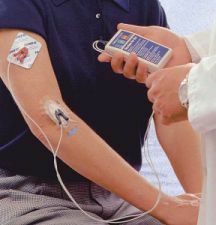 Traditionally, dexamethasone is injected or administered intravenously to patients, but using iontophoresis allows therapists to target the affected tissue directly while bypassing the rest of the body. Although dexamethasone sodium phosphate is the most common choice, other solutions are producing excellent results. For instance, ketoprofen is an alternative nonsteroidal anti-inflammatory drug that treats many of the same conditions as dexa­methasone. Potassium iodide is the recommended choice for treating scar and tendon adhesions. Potassium iodide can soften and remove collagen, which allows an area to be molded and stretched. And acetic acid is the drug of choice for treating soft tissue mineralization, including heel spurs, calcific tendinitis and myositis ossificans.